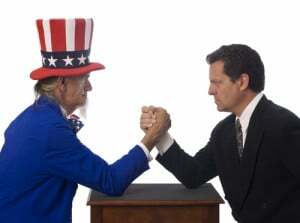 The US Federal Government passed a law specifically targeting a single industry. Hundreds of small businesses across the country have been shut down. In a few extreme cases, some of these small business owners have been imprisoned. In fact, the media commonly refers to the most famous of these innovators as a “snake oil salesman”. This moniker, although fairly accurate, distorts this great leader’s contribution to the health of hundreds of thousands of American’s. (And his fantastic use of social media — before social media ever existed.) The term “snake oil salesman” has become a common phrase for describing a person who knowingly sells fraudulent goods or who is himself a fraud. Unfortunately, though, the very first snake oil salesman, was, in fact, a very successful businessman who helped thousands of people reduce discomfort in a time where modern medicine was in its infancy. His discovery is still being used by some of the most successful pain relief companies in the world, and the ingredients are natural — and safe. I know that a number of readers who read the summary of this article might have thought that I was talking about modern small business owners dealing with new regulations. However, government regulations on small business is not new. This article is look at a very successful entrepreneur from the late 19th century who was able to capture the imagination of people to sell them a cure-all medicine. Clark Stanley was an American cowboy from Abilene, Texas, who was born sometime around 1854. Stanley made a big splash with his Rattlesnake Oil Liniment at the World’s Colombian Exposition (The Chicago World’s Fair) in 1893. In the era of P. T. Barnum, Stanley understood the power of showmanship to capture the attention (and imagination) of a crowd and convince them to purchase his product versus the hundred (if not thousands) of other products being pitched at the fair. The Chicago World’s Fair was established on the 400th anniversary of Christopher Columbus’ first trip to America. It was to be a showcase for new products and innovations. Among the products introduced at the fair were Cream of Wheat, Juicy Fruit gum and Pabst Blue Ribbon beer. Technological innovations like the dishwasher and florescent lighting were also featured. (See 7 Things You May Not Know about the 1893 Chicago Worlds Fair.) However, these products and innovations were just a few among many, so Stanley needed a way to create a buzz for his product. Being from Texas, Stanley must have figured that public interest in wild-west shows of the time might be a good hook to pull in customers. Author Erika Janik described Stanley’s pitch in her book Marketplace of the Marvelous: The Strange Origins of Modern Medicine this way. Stanley claimed to have learned of snake oil’s healing powers from his years as a cowboy out west with the Hopi Indians in the 1870s and 1880s. He shared his discovery with the public at the 1893 World’s Columbian Exposition in Chicago where he pulled live snakes out of a sack, slit them open, and plunged their bodies into boiling water. As the fat from the snakes rose to the top of the pot, Stanley skimmed it off, mixed it with his previously prepared oils, and sold his liniment freshly prepared to the crowd that gathered to watch the spectacle. It is actually quite possible that Stanley did actually receive the recipe from Indians in Arizona. However, some speculate that Stanley actually received the idea of medicinal snake oil from his time in California mixing with Chinese laborers. (See A History of Snake Oil Salesmen.) Most of the Chinese laborers who contracted to build railroads were from peasant families. Many of them brought with them local medicines, including Chinese Snake Oil. The Chinese recipe was made from the oil of the Chinese water snake, which is rich in omega-3 acids. Today, we know that these omega-3 oils actually help reduce inflammation, but the big problem with using Chinese snake oil in America is that… well, America doesn’t have any Chinese water snakes. So, if it is true that Stanley got his medicine recipe from the Chinese, it is also possible that he might have thought, “We don’t have any Chinese water snakes in Texas, but we have a LOT of rattlesnakes, and, heck, most people want to get rid of them.” If that is the case, then Stanley should likely be remembered as a fantastic marketer, but not a great pharmacist. Clark Stanley partnered with a druggist in Boston to produce and market his Rattlesnake Oil. He claimed to have killed over 3000 rattlesnakes in 1901 to supply demand from the public. According to Janik, Clark Stanley claimed that his snake oil would cure “everything from rheumatism and sciatica to lumbago, frostbite, and sore throat.” However, in 1906, the Pure Food and Drug Act was passed by Congress. As a result, in 1916, Stanley’s medicine was examined, and authorities determined that it contained no snake oil at all. It was mostly mineral oil along with some red pepper and camphor. Since the Federal Pure Food and Drug Act was mainly created to ban mislabeled food and drug items, Stanley’s snake oil was said to have no medicinal value. Stanley was fined $20 (approximately $439 in 2015 dollars). Was the Snake Oil a Hoax, Though? Interestingly, though, although the snake oil that was examined had no actual snake oil in it, the red pepper and camphor that was there actually had a number of medicinal uses. Many of these medical uses correspond with Stanley’s claims. Today, a number of over-the-counter pain relievers use capsaicin as an active ingredient. Capsaicin is a natural remedy made from chili peppers. It works by inhibiting the pain receptors in the body. The website Natures Poisons posted a great article about these types of medicines. If you’ve ever eaten a hot pepper, you’ve likely experienced this process. The first time that you bite into a hot pepper, you feel pain and heat. As you become more and more accustomed to the peppers, the heat becomes less painful. Eventually, you build up a tolerance. Capsaicin is also a natural fungicide. Camphor comes from the Camphor Tree. It is the active ingredient in Vick’s Vapor Rub, Icy Hot, and Tiger Balm. Many people, today, use these products to relieve achy muscles and chest congestion. It is also the active ingredient in Blistex which is used to treat cold sores, etc. Stanley also claimed that his product would cure “bruises” which seems odd until we realize that a toenail fungus can sometimes appear as a bruise under the toenail. Capsaicin has been seen to be a good treatment for toenail fungus as well. Will it treat frostbite, though? I have to admit, when I read this, myself, I was skeptical. Then I found an article about a patient who had chronic foot pain from frostbite who received a 50% reduction of pain using a capsaicin patch. Sore Throat: Well, a sore throat caused by a yeast infection such as thrush, would likely be cured by use of a natural fungicide. In addition, a number of home remedy websites claim that cayenne pepper works really well to cure a sore throat. Toothache: Just as with muscle inflammation, it is quite possible that the snake oil salesman was right about pain reduction for a toothache as well. 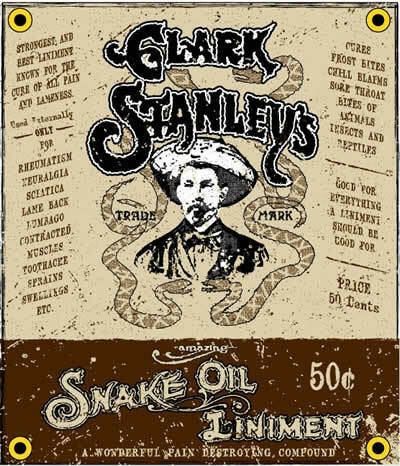 So, although the product that Clark Stanley, the original snake oil salesman, was marketing wasn’t actually snake oil, it quite likely was a valuable cure-all medicine of the time. After his company was shut down, it took us another 40 years to create similar products. However, those products are used in great quantities today. If Clark Stanley had showed up at the World’s Fair asking people to spend today’s equivalent of $14 on a bottle of mineral oil and cayenne pepper, I doubt he would have had many takers. (Even though the medicine worked.) But by selling the story, people flocked to his booth. His showmanship using one of the most dangerous predators in the West got attention. He was creating his own social media in a time when social media didn’t exist. People flocked around his booth. They gladly exchanged $.50 for a cure. And, hundreds (maybe thousands) of customers received relief.